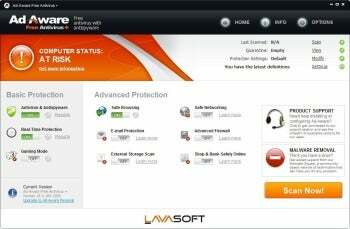 Over the years, Lavasoft's Ad-Aware product line has made itself a name in the highly competitive anti-malware marketplace, and today's release of version 10 introduces a new UI, new pricing ($12 per year for Personal, $36 per year for Pro), and more features--and a new name--for the popular free edition. This blog item discusses only the new design and features. PCWorld has not tested yet tested Ad-Aware 10's effectiveness in fighting malware. Ad-Aware's free version offers comprehensive protection at no cost, with a slick new interface. 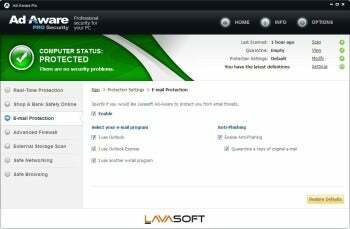 The work Lavasoft put into the UI shows right from the installation phase. Ad-Aware uses its own custom installer, which downloads the most recent definitions file as part of the installation process, so you don't have to update Ad-Aware immediately after installing it. Slick as this is, the installer does still require a system restart before Ad-Aware can start working. As part of the installation process, Ad-Aware suggests installing its browser toolbar, and switching your default homepage and search engine to Blekko. These are enabled by default, but you can opt out of them if you wish. The browser toolbar is a small part of the Ad-Aware experience. Ad-Aware 10 introduces all-new UI: Gone is the compact bluish window with the radar-like Scan System icon, replaced by a more spacious window with dark accents and a greenish theme. The entire interface changed, and the home screen is now split into Basic Protection on the left (Antivirus & Antispyware, Real-Time Protection, Gaming Mode), and Advanced Protection on the right. Advanced Protection is a collection of features such as E-Mail Protection (assuming you use an email client such as Outlook), External Storage Scan (to check USB storage devices as soon as you plug them in), and an Advanced Firewall. In the Free and Personal editions, most of the iPhone-esque toggle buttons controlling Advanced Protection features are switched to the off position, and if you try to switch them on, you get a popup saying that this feature is only available on Ad-Aware Pro. Even after upgrading to the Pro version, I was unable to switch on the Advanced Firewall and Shop & Bank Safely features: No matter how many times I clicked the toggle button, it would slide to On, and then immediately slide back to Off, with no error message or any other hint as to what might be wrong. Other Pro features toggled on just fine. Ad-Aware Pro Security enables features such as email protection and scanning USB drives as you plug them in. The work Lavasoft put into simplifying the interface shows. Like any self-respecting anti-malware product, Ad-Aware makes sure you know if your computer is at risk. A huge (138-pixel tall) banner on top of the window displays an exclamation point, along with a message in all-caps saying COMPUTER STATUS: AT RISK. Can't really get much clearer than that. A large, soothing orange button on the bottom right corner exhorts you to "Scan Now!" and once you click it, launches a quick scan. The scan took about five minutes to run on my computer, and completed without delivering any further alerts. The home screen feels like the dashboard of a powerful application, but will not confuse even a novice user. The Scan Now button can't be missed, nor can the current system status. More technically inclined users will be able to view scan reports, quarantined files, protection settings, and definition update status with ease, via links on the top-right corner. It is very easy to switch features on and off via the interface, although there is no real reason to toggle protection off. The only toggle button I see users routinely using is the one for Gaming Mode, newly available in the free version. This is a silent mode in which Ad-Aware doesn't show pop-ups. Another significant new feature in the free version is real-time protection, which scans your computer as you work. All in all, Ad-Aware 10 is a promising product, and it feels polished and modern. Its free version is very functional, and is a viable alternative to free offerings like Microsoft Security Essentials, at least in terms of interface and ease of use. For its effectiveness, only testing will tell.